This quiche takes less than an hour to make and can be made ahead. Add dry ingredients to a bowl and whisk to combine. Place ⅔ of dry ingredients in the bowl of a food processor. Sprinkle cold cubed butter over flour. Sprinkle remaining flour mixture over the top and pulse just until the mixture is barely broken up, about 5 short pulses. Place mixture in the bowl you previously had the flour in. Sprinkle with the ice water. Using a rubber spatula, fold and press the dough until it comes together in a ball. Roll out one disk and place in the bottom of a quiche pan or pie dish and place crust in the refrigerator while you make the filling. Add the eggs, cream, nutmeg, pepper and salt to a bowl and whisk to combine. 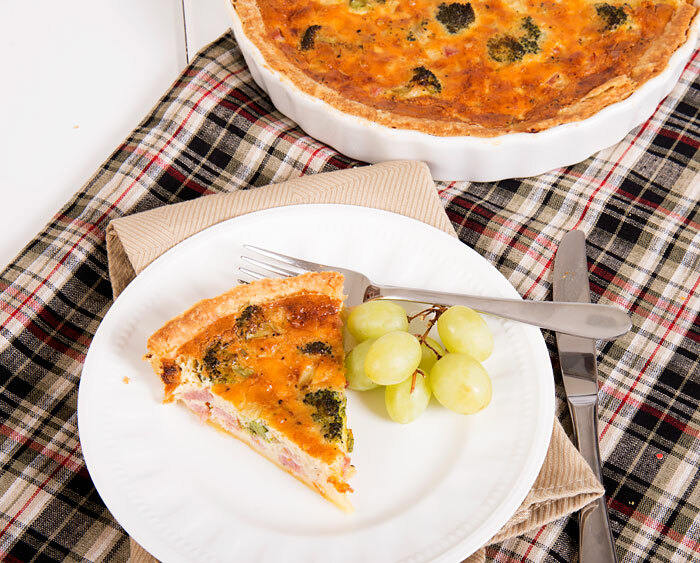 Take the pie crust out of the refrigerator and sprinkle the ham, broccoli and cheese on the bottom of the crust and pour over the mixture. Place in pre-heated oven for 40 minutes or until the center puffs up and is just barely wobbly.